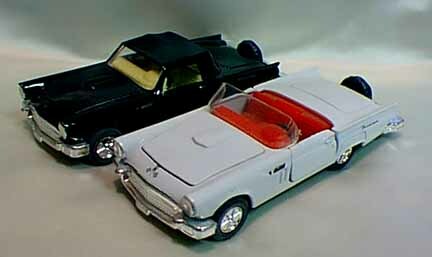 Distinctive characteristics for a 1957 T-bird: Front Fender vents; tail fins at 45o angle out from body; massive curved bumpers which do NOT include a continental kit or bumper extension; Hardtop may be porthole or non-porthole. New style Thunderbird emblem on non-porthole hardtops. may not work on some browsers Listings are in alphabetical order by brand or manufacturer. 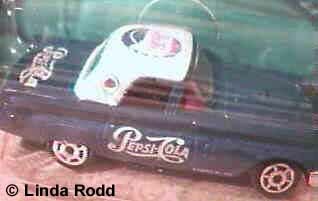 Listings cover diecasts, plastic molds, sand casts, etc...~ any 3-Dimensional 1957 Thunderbird that rolls or appears to roll whether made to be decorative, as a toy, or for the collector. 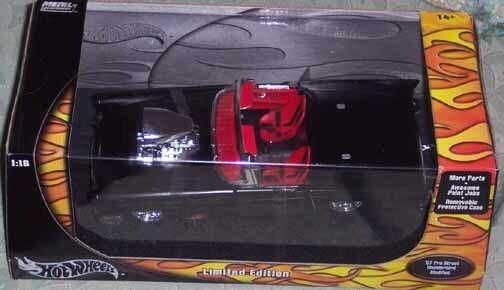 Kid-Riffic Toys (see Simple Wishes) / China 2003 . . . .
#41 1:63 Red or Yellow w/black interior/ hood opens; black cont'l kit; black bumpers & chassis - "Corgi Jr"
1987 57 T-bird Pedal Car . 7-up pink promotional car - part of giveaway from 7-up during a promotional. 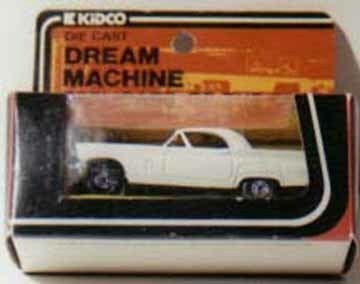 7-Up also gave away several dusk rose 57 Thunderbirds thru a drawing. 2002 . 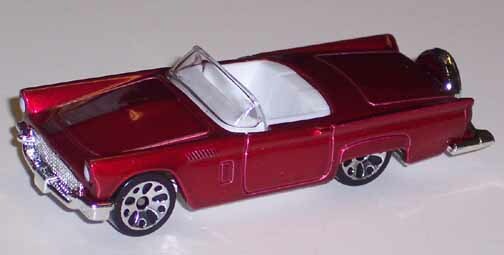 57 Thunderbird 1:58 red with white interior; "Driver 2" printed on side; advertising the PlayStation Game. custom?? Matchbox-Lesney / England - Macau - China 1982 - . 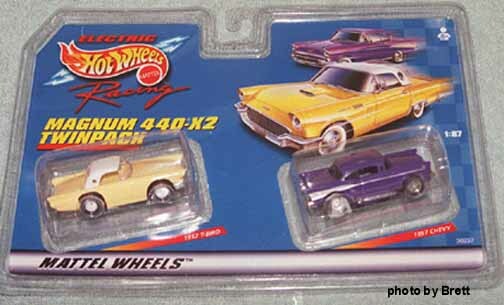 #42 1:63 Various - see Matchbox list and article. 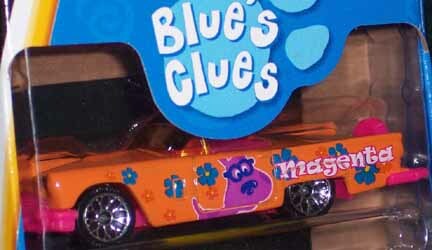 Matchbox-Mattel 2004 Blue's Clues 57 T-bird 1:63 yellow-orange with orange windshield; pink interior and bumpers. "magenta" on side with yellow and blue flowers. 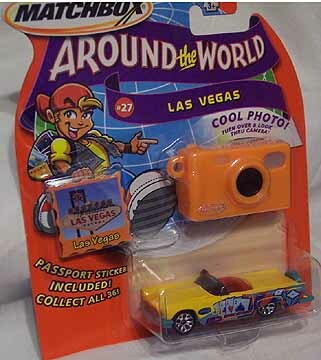 Matchbox - Mattel / Thailand 2008 M6400 asst. 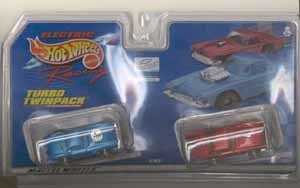 34307 1/63 Light blue with all white interior; chrome bumpers and cont'l kit, 3 spoke wheel;smoke windshield; in 10 pack - exlusive color to 10 pak. 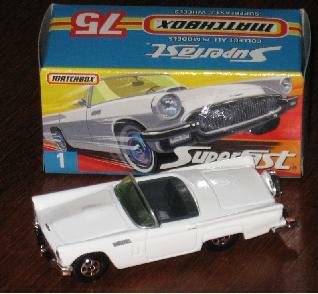 Ford Thunderbird 1:64 Convertible with extended rear bumper & cont'l kit; wheels all the same size; made with "Corgi's" old Corgi Jr. mold from 1980; no chassis date. 2011 to present . 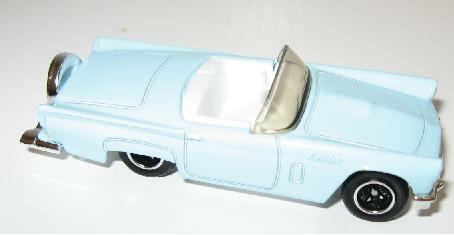 Hot Wheels '57 T-Bird 1:64 Non-Porthole hardtop; rear wheels larger than front wheels; polished metal base; 2011 or 2013 on base. 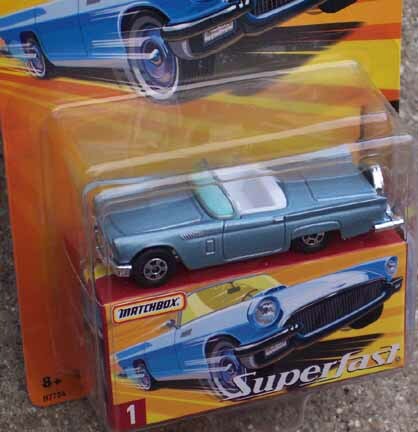 Mattel / China, Thailand, or Malaysia 2012 Hot Wheels Classic 57 T-bird 1/64 retooled remake of 1969 model. McDonald's 1990 . 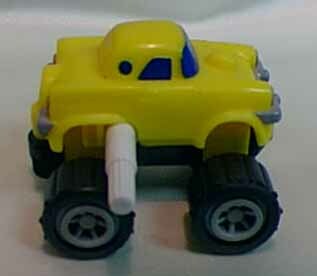 Mighty Mini 4x4 1:80 Plastic; Yellow w/ monster wheels & cont'l kit; wind-up motor. 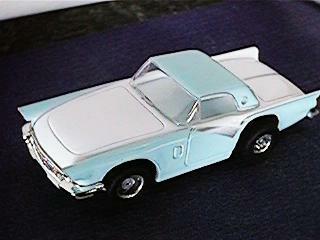 Rather generic looking t-bird but has 57 style bumpers; Came in "Happy Meals" box w/gas station cutouts. 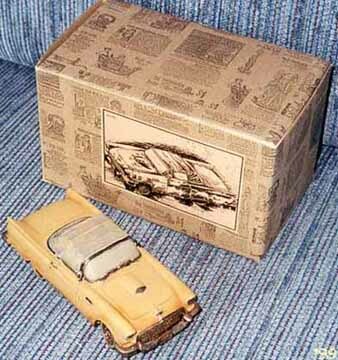 Golden Arches molded in trunk; cont'l kit. MTH see Ertl . . . . MTH contracts with diecast companies to use models for their train sets. 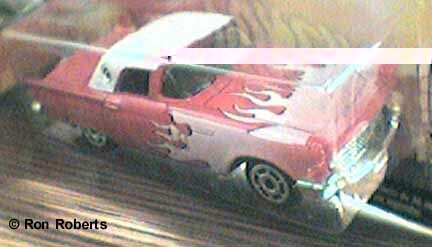 They have used Ertl ('57s), YatMing('55s & 2002/2003), and MotorMax('56s) diecast Thunderbirds. some are unique colors to their sets. PB ~Phat Boyz ~ . . .see "Simple Wishes" . .
Popular Imports / China 1998-99 . Antique Car 6.5" Polystone; golden yellow; soft top - looks like it needs restoration! 1998-99 . 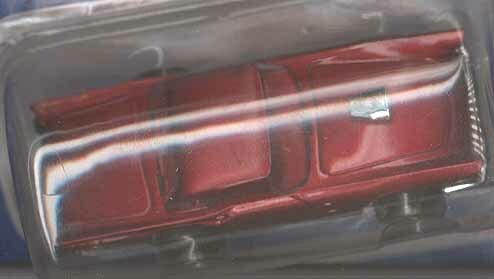 Windchimes 2 7/8"
1979 ' '57 T-bird #H-1104 1/32 Plastic Model Kit; snap together; Red with non-porthole top; black interior. Road Signature - see Yat Ming . 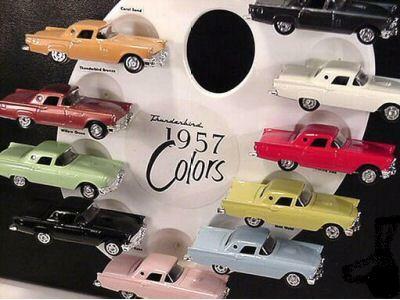 . . . .
* Continental kits were available though in 1957 and later years. 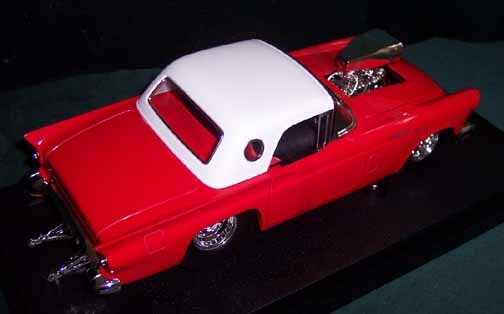 The proliferation of 57 models with continental kits derives from the time period of the late 70's when the TV show Vega$ aired and the star of the show drove a red 57 with a continental kit. 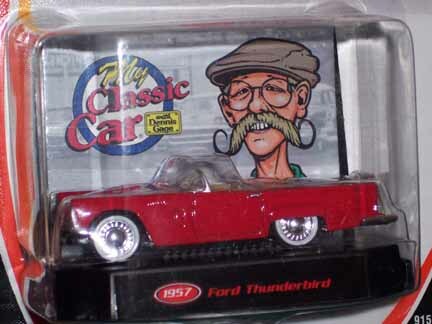 If you don't see your '57 classic t-bird model listed at all, Please contact me with a description including the manufacturer/ country of origin / year made if known / size / general & specific description including color of body and interior and type of top, hub style, etc. 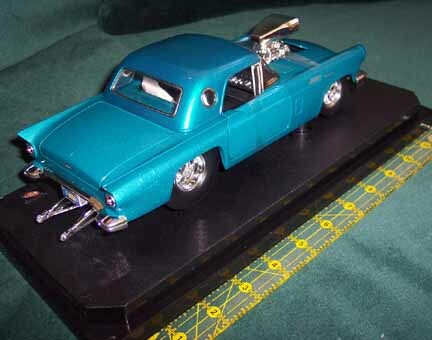 Models are added all the time so come back periodically to see the additions.